Well the 2018 season has been a very busy one! I would like to thank Tim and Jimmy for their efforts in guiding this season, both have produced some awesome hunts, and of course a big thank you to all the hunters who made the season possible. I have been winding down at home over the last week or so and am now busy preparing next years hunts. 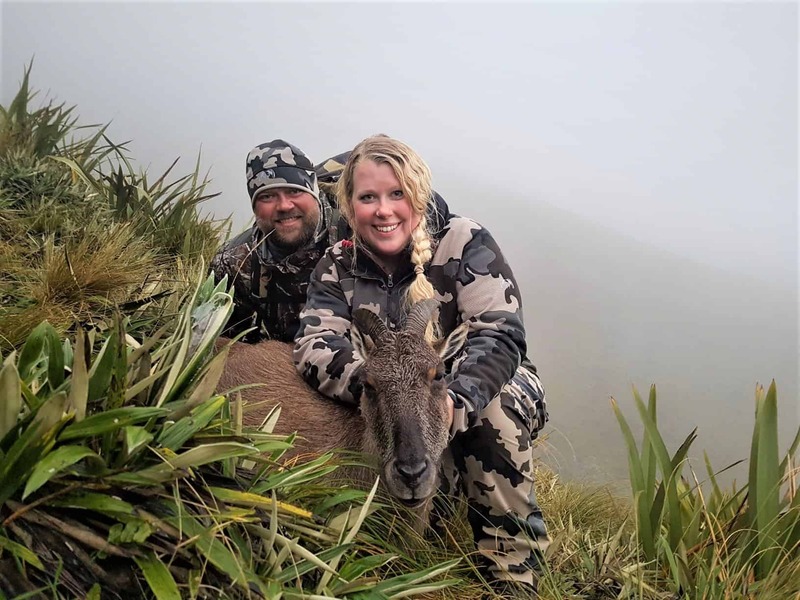 We still have some spaces for 2019, if you are after the real NZ hunting experience contact us now to organize the trip of a lifetime. The first ‘Roar’ was heard on the 21st March and she was all go from there. This years ‘roar’ seemed to go on and on and there was very high numbers of deer through out our hunting areas. This made all our hunts very exciting and some massive stags were taken during April, with a few pushing 40″ long. The highlight of our stag hunts for me was taking a big old stag with Mike and his wife Kayla, this stags teeth were worn down to the gum lines, pretty awesome to find such old animals in our areas. Mike luckily found the cast antler of this stag, most likely from last season, which showed some regression in the antlers, a cool find! Our best stag of the season was taken by Chris from Australia, guided by Tim, a classic high country 12 pointer(6×6) which scored around 290″ DS, a very well balanced head with perfect symmetry and shape. We did not have a huge number of wilderness hunts this season, most hunters opted for private land hunts which worked out well. The weather during alot of the season was rather unsettled and this did make our wilderness hunts a little more challenging. One of the biggest bonuses of NZ is its small size, we can easily move areas and change plans on the run, which is a much nicer option than sitting in a tent for a week in the rain! Our Tahr hunting was once again superb, we pride ourselves on taking good age class bulls and once again kept our average bull in the 8-9 year age class and around 12.5″, with a very high percentage(70%) of bulls over 13″. The highlight of my wilderness hunts was a trip with Byron Pace from Pace Productions (https://www.thepacebrothers.com/blog/itw-podcast-84-joseph-peter-hunting-in-new-zealand), Byron is an amazing photographer and I am looking forward to seeing the film and photos he has taken on the trip. Byron hunted for a week on the west coast and took a bull of a life time, 13-14 years old and just pushing out to 14″, he also took a nice representative Chamois on the hunt. If you want a real mountain hunt with a trophy to match Tahr are hard to beat. Mountain hunting prices worldwide are soaring, and Tahr are one of the best value for money hunts out there. From a full on back pack wilderness hunt, to a more leisurely private land hunt, we have a Tahr hunt to suit all hunters. Our Tahr hunts run a very high success rate and can also be paired with Stag or Chamois. It really is one of the best true mountain hunts on offer right now. We only had a handful of Chamois hunts this season, and a few hunters opted out of their chamois in favor of other species(which is entirely their call, and not an issue). I do think alot of people underestimate the Chamois, they are a challenging animal to hunt, and in many ways harder than Tahr. Chamois make for an equal trophy in anyone’s books who has hunted both species. If you want a challenging mountain combo Tahr and Chamois are as good a combo hunt as anything out there. Byron Pace enjoying the wilderness experience! Many of our hunters took advantage of our plentiful small game in NZ, which makes for some great shooting practice. A couple of days wallaby shooting is a perfect way to end a hunt and test out your shooting skills. We also take a few Nanny Tahr to help balance the herd, this is often just as challenging as taking a mature bull and we offer these free of charge on a trophy hunt. Wallabies always make for some exciting shooting!